FC Barcelona are crowned 2015 FIFA Club World champions after beating River Plate 3-0 in the final where Lionel Messi scored the opening goal before Luis Suarez added two in second half. FC Barcelona completed their fifth title in 2015 as they ran out comfortable winners against South American side River Plate in the final of the 2015 FIFA Club World Cup. Barcelona started with Suarez, Neymar and Messi and it took just over half an hour for Messi to poke home first for Barcelona. Suarez scored twice just after the break to pretty much settle the tie. 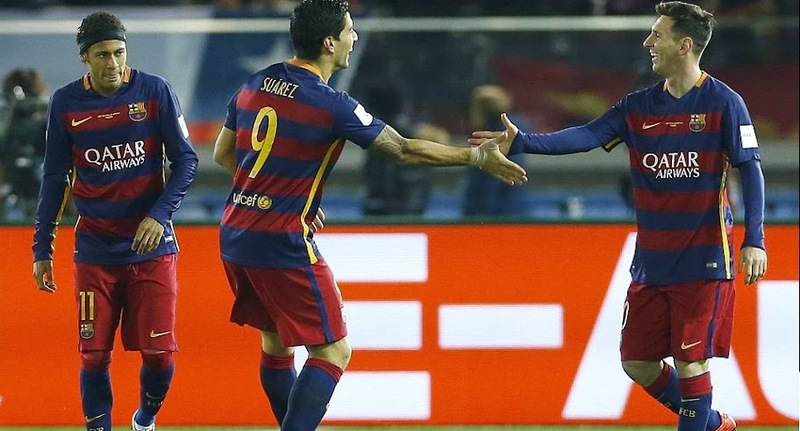 Neymar and Messi recovered just in time to start against River Plate in the final alongside hattrick hero Suarez. Barcelona started the game in cruise control and created chances at will. Messi scores to make it 1-0 against River Plate:It took a world class save from River Plate keeper Marcelo Alberto Barovero to deny Messi but it did not take long for Messi to score his first of the night and 5th overall in club world competitions when he poked home Neymar’s headed layoff. Luis Suarez finished off incredible counter attacking move to put Barcelona 2-0 up.Suarez was put through on goal with a superb ball by Iniesta and he made no mistake in making 2-0 for Barcelona with a neat finish which deflected off the keeper in the back of the net. Barcelona vs River Plate Team News & Lineups: FC Barcelona might have both Neymar and Lionel Messi ready to play some part in the final and since any of the 23 players can be named in starting lineup and used as sub there won’t be any official team news as Luis Enrique can use of the substitute during the match. River Plate has a full squad to choose from as they are not suffering any injuries. Former Barcelona/Real madrid striker Javier Saviola should be fit and might play some part against his former team. River Plate is coming into this game on the back of 1-0 win over Japanese Champions Sanfrecce Hiroshima and they do pose a real threat for Barcelona with Andreas Iniesta rating this game as 50/50 encounter. This is how I expect both teams to lineup on Sunday. Match Predictions: The kind of form Barcelona is in at the moment its hard to see them losing a game of football. They are absolutely lethal even with only Suarez playing and if they will have both Neymar and Messi fit and starting the final Barcelona should cruise through to the final win. 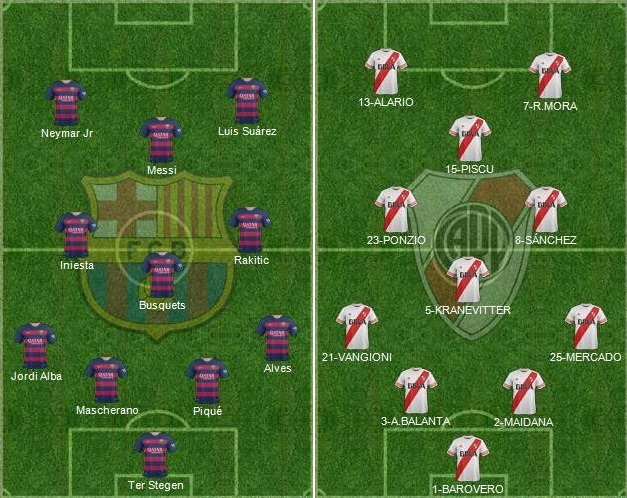 Having said that River Plate is much better side than what Barcelona faced in the semifinal. River Plate players has been anticipating this clash for months and with full fit squad they might just have a surprise or two. I am going with a 2-1 win for Barcelona and Luis Suarez to continue his impressive run of form.